In a bowl, mix all the above ingredients and Serve. Cucumber Raitha is a very good combination for Vegetable Pulav/Biryani. Notes - Since chaat masala has salt in it, check and add salt if required. Love the addition of chaat masala.. Refreshing and tasty looks really great. Great looking raitha,love the addition of chaat masala..
i love this raitha very much...healthy n yummy! 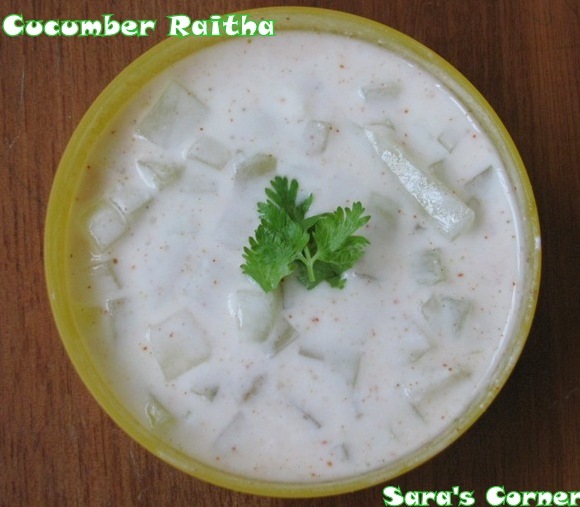 Wow, Sara..What a coincidence I've also posted cucumber raita today, Ur's also looks yum..
Looks nice and gr8 .. thanks for sharing dear !! I love this raita when served very chilled. yummy.